Chazal teach us that when we hear the shofar, we are supposed to focus on crowning Hashem as our King, and committing ourselves to revealing His Kingship in this world. 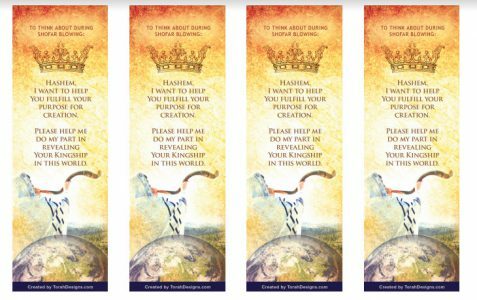 Thankfully, the fine folks over at TorahDesigns.com have designed a printable poster and bookmark which can be used by both the scholar and the layperson to help maintain focus during shofar blowing. Feel free to let your students and congregants know of this poster and bookmark ahead of coming to Rosh Hashanah services. You can download the free bookmark and poster here.